It is an exciting Wednesday. We have yet another Phone-A-Friend update! Seriously, these just make our day. This time we heard from Julie. 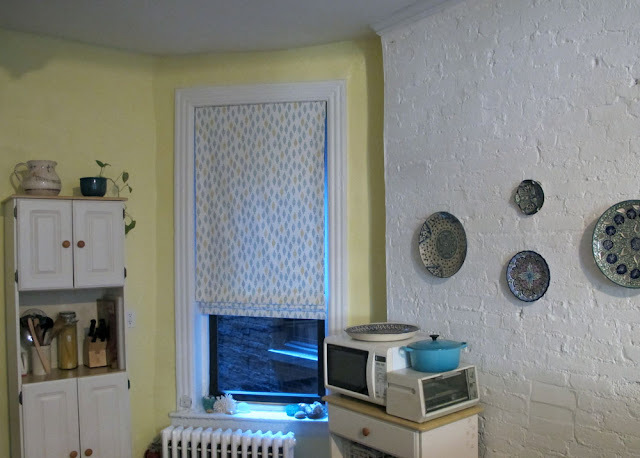 You might remember that Julie was looking for help with her NYC kitchen... specifically the window treatment. 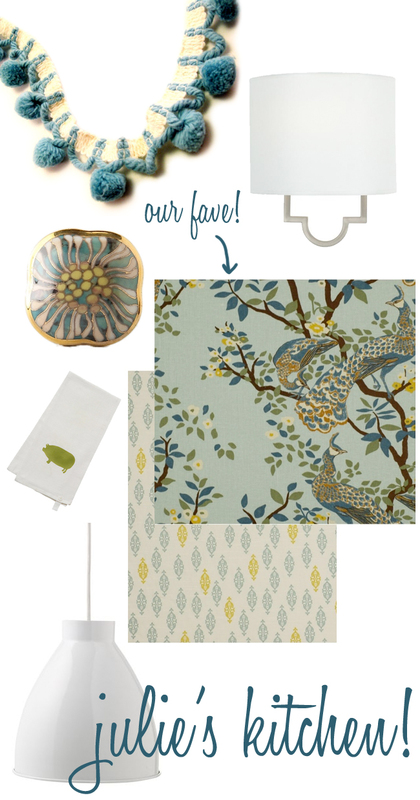 And here is the mood board we came up with. Find all of our sources, etc, in the orignal post. And here is Julie's finished kitchen with custom window treatment! Wow! Julie, we love it! Congratulations on an awesome job. 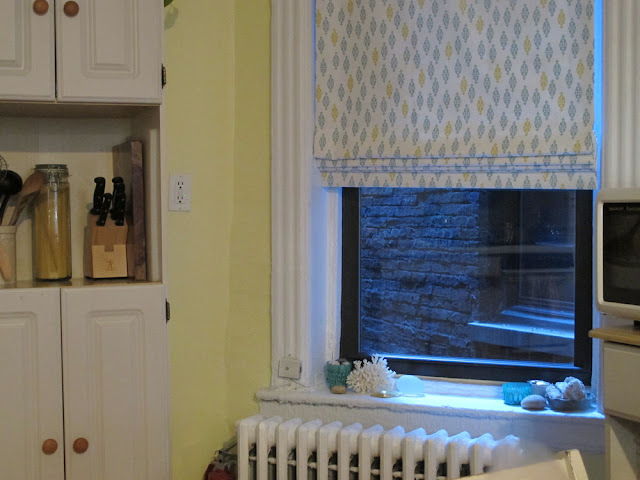 -Our favorite change is the new custom roman shade from The Shade Store, using the Dwell fabric you had suggested for the doorway. We LOVE what it does to the kitchen; the photos of course do not do it justice. 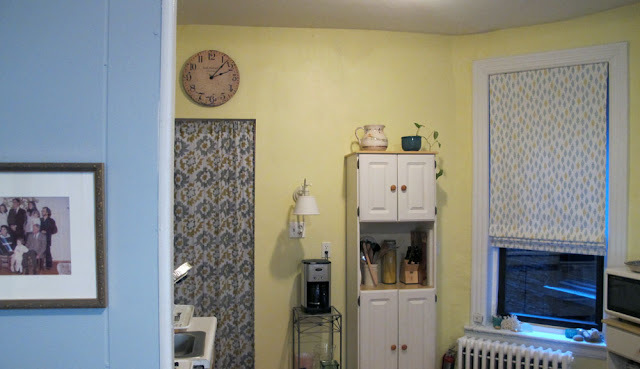 -Using your suggestion of replacing the doorway curtain with one that features complimentary colors, we snagged this one on sale from Anthropologie. -Another big change was oh-so-easy: furniture rearranging! 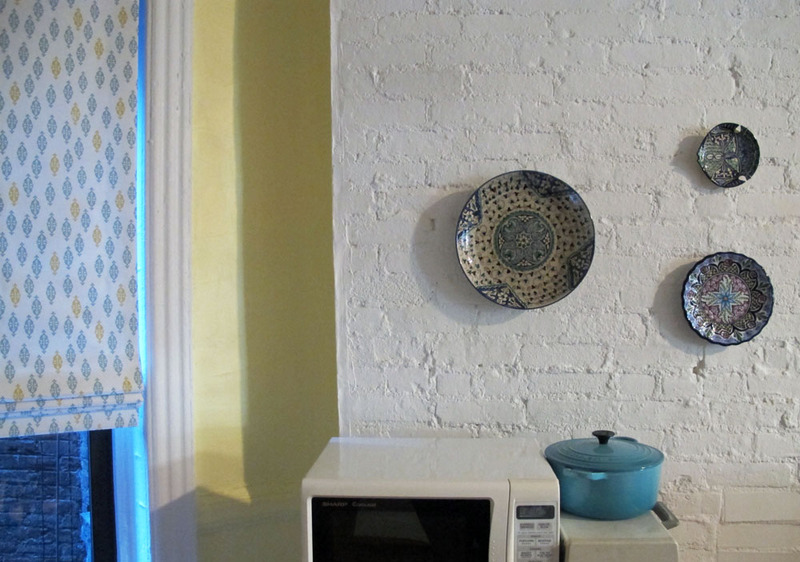 The room feels much better this way, and it also opened up the big white brick wall. 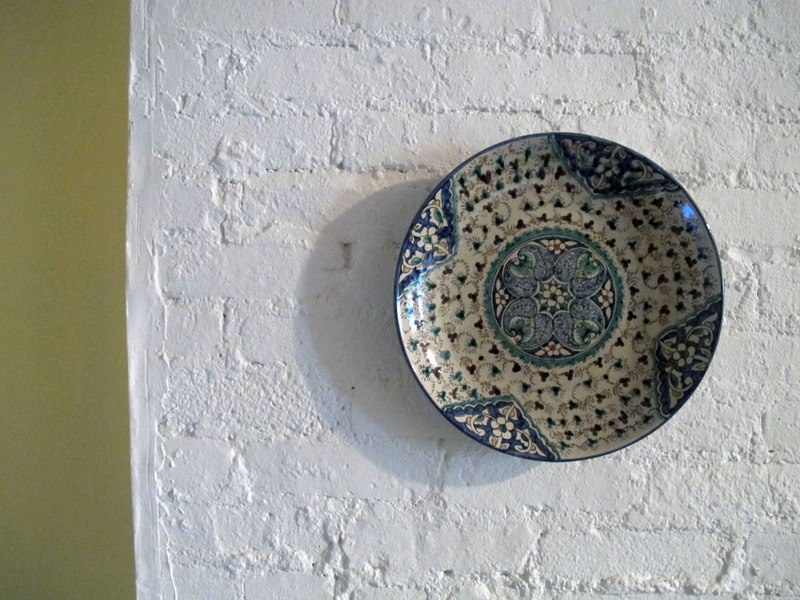 It's the perfect space for displaying some of our gorgeous painted ceramics: one from our Mexican honeymoon, and the rest from our brother-in-law and his family, carried many thousands of miles from Uzbekistan. -I made a simple swap of the wall-mounted light to a plainer, white lamp. I had the cord shortened to eliminate sloppiness. I love the light you suggested, but hard-wiring is frowned upon in my rental space so I just wasn't willing to fight that particular battle. My husband's reaction: "So you bought the exact same lamp in white." Well, sorta true! -I also made a some other small changes that eliminated the reds and other random colors that were in the room, tying them all loosely together for a more cohesive, yet not matchy-matchy, look. The (dying) plant was re-potted in a new pot from Etsy. 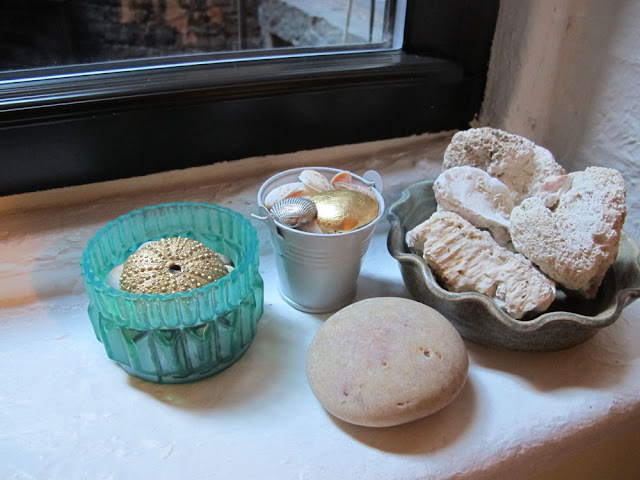 I also swapped out the arrangement of objects on the windowsill and put together all my seashells, rocks, and bits of coral from various trips. The turquoise votive holders were a recent gift, and the gilded shells and sea urchins are from my latest crafting project. I like they way they relate to the whole yellow-plus-blue scheme without being a precise match. -After a purge of our one tiny closet, the vacuum lives there. This makes me HAPPY. 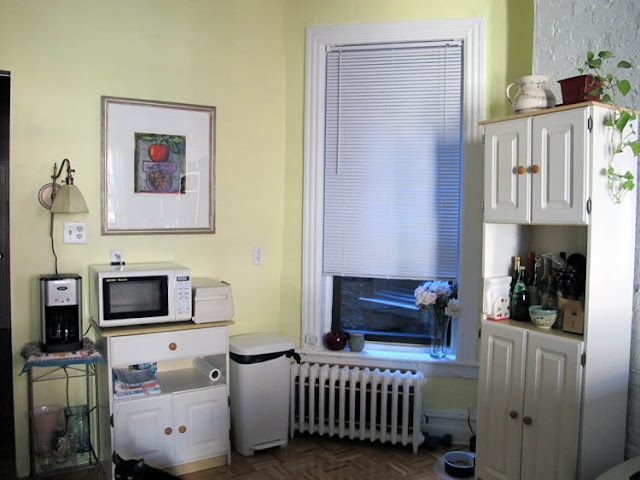 -Finally, the photos don't quite show it, but a fresh coat of paint on the radiator is one of those little details that perk up the whole space. We wouldn't have come this far without all your wonderful suggestions, so THANK YOU again! This has inspired me to redo the other rooms as well... post-thesis! Interested in Phoning-A-Friend? Just email us! Read though our Phone-A-Friend archive here. Love! and I love how all the little changes added up. The space is great. Not matchy matchy at all, just well put together -- good design!